Simon & Schuster Books for Young Readers, 9780689862939, 112pp. Goosebumps and Bill Nye the Science Guy fans, meet Franny! There’s nothing better than being a mad scientist—at least according to Franny. So she’s making it her mission to help her classmates discover their own inner mad scientists. All Franny needs for her latest experiment is a few volunteers, a half-completed two-headed robot, and an invisibility potion. Only this experiment just might prove to be Franny’s most difficult. Because what do you do when your classmates don’t know anything about mad science—and there’s a doubly dumb robot running amok to prove it? Jim Benton is the New York Times bestselling writer of the Dear Dumb Diary series and a cartoonist whose unique brand of humor has been seen on toys, television, T-shirts, greeting cards, and even underwear. 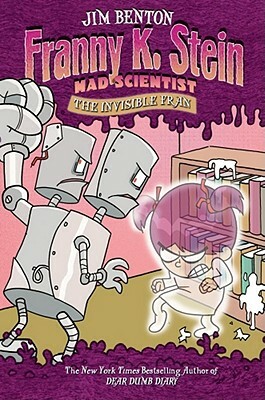 Franny K. Stein is the first character he’s created especially for young children. A husband and father of two, he lives in Michigan, where he works in a studio that really and truly does have creepy stuff in it. National Enquirer Smart, confident, and totally PUNK!